File contains a photograph of the Dalhousie band at a Dalhousie-Acadia football game on October 3rd, 1936. 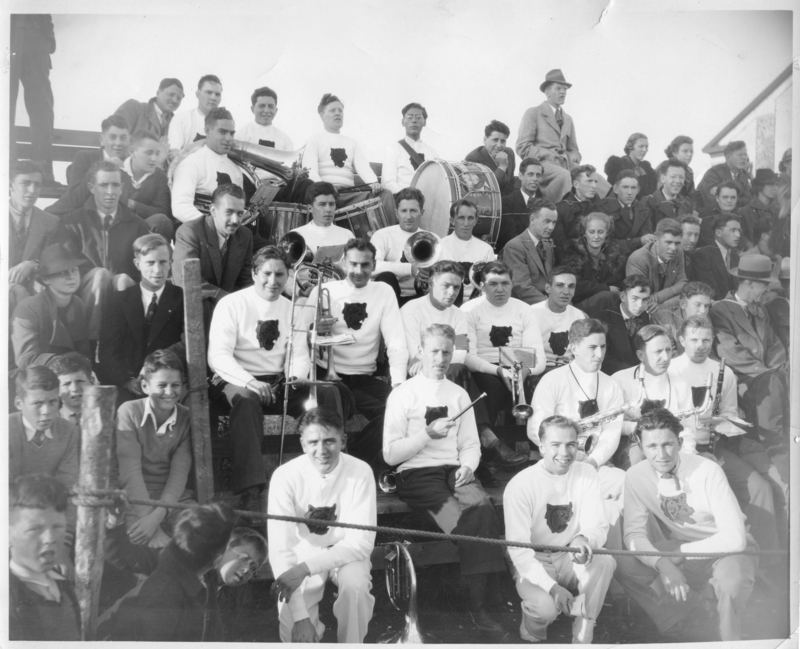 The photograph shows the following band members sitting on bleachers: Henry Reardon; Raqhael Wallace; Grodon Stoddard; John Morrison; Frank Morse; Leo Landerville; Alex Farquar; Lloyd Dalton; Nora Jamieson; Edgar Stewart; Clem Egan; Henry Gold; Jack Burley; Ralph Plummer; Ian Robb; McLeod; Bud McKenna; Fred Stiefel; Fred Danziger; J. Alexander Webster; Cameron Annear; George Baird; MacMillan; Jack Reynolds; John Hutton; Oliver Campbell; Roy Killam; Robert Levine; Stan McQueen; Henrik Tonning; Ed Harrington; Daniel Matheson; Zilpha Linkletter; Ben Dubilier; Carvel MacIntosh; Murray Feigenbaum; David Redmond; Selig Geller; John B. Baker; Glynn Fitch; Jean MacDonald; Marion Little; and Archie MacKenzie. A sheet of paper with the names of all of the band members is included with the item.